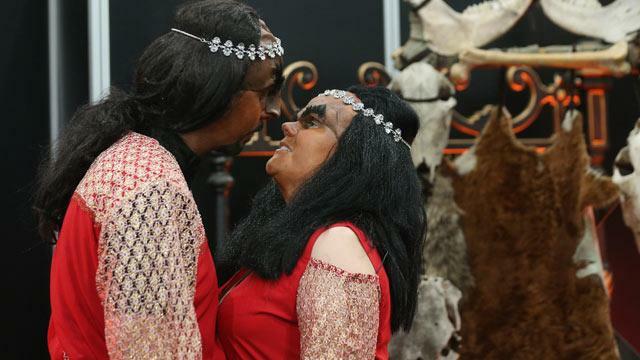 A Swedish couple made history when they had what's believed to be the first Klingon-style wedding in Britain this weekend - complete with the costume and face makeup that characterizes the warrior race from the "Star Trek" series. The unusual nuptials took place on Friday in London at a convention for fans of "Star Trek," the hugely popular science fiction series that started on television in the 1960s, spawning TV spinoffs and movies to satisfy legions of ardent fans. The groom, Sonnie Gustavsson, 29, was a longtime "Star Trek" fan and he introduced his bride, 23-year-old Jossie Sockertopp, to it, Reuters news agency reported. RELATED: 'Star Trek: The Original Series': Where's Are They Now? Gustavsson told Reuters that he was inspired by an episode of "Star Trek: Deep Space Nine" in which Worf, a Klingon Starfleet officer, marries Jadzia Dax, a Starfleet science officer, in a traditional Klingon ceremony. "We saw the clip from the series … and we thought it was very romantic about beating hearts and a battle for each other. We really liked it, that's why we want to do this," Sockertopp told Reuters. The BBC reported that the bride had to be persuaded to have the Klingon wedding. "The ceremony was his idea. I thought about it a lot and then I said 'let's do it'. It's a once in a life time thing," Sockertopp said. The ceremony reportedly included some phrases in Klingon, the language spoken by the fictional warrior race. Gustavsson wore a crimson tunic over black pants, while Sockertopp wore a crimson dress. Both wore dark wigs and facial prosthetics to give them the prominent brow ridge that's typical of Klingons. Gustavsson and Sockertopp had a legal wedding prior to their Klingon ceremony.